Hey there! Glad to see you made it into 2010. For my first post of the year, I thought I’d take a closer look at one of those issues that usually ranks pretty high on many people’s lists of memorable Daredevil issues. It’s cheesy, cute, not perfectly logical, but an uncommonly emotional read. What am I talking about? Daredevil #223, The Price, by Denny O’Neil and David Mazzucchelli. Published in the fall of 1985, The Price was a tie-in to Secret Wars II, featuring the mysterious Beyonder, a character as well known for his jheri curls and distinctly 1980’s look as for his background story. To make a long story short, the Beyonder is a very powerful alien being who is visiting Earth in search of enlightenment. 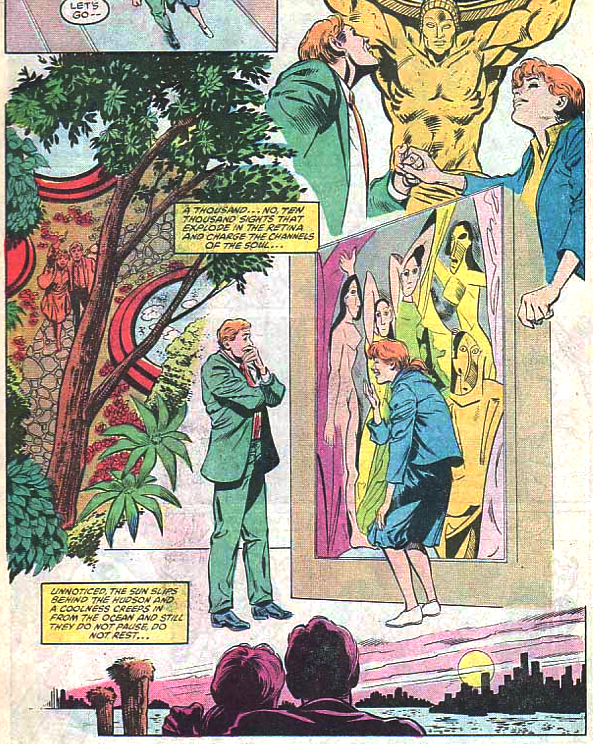 While it’s the Beyonder’s desire to find a legal means to own the entire world(!) that brings him to the law offices of Nelson & Murdock – and thus gets the story going – this issue is very much about the title character. Matt is taken on an emotional roller-coaster when the Beyonder gives him his sight back as a retainer to persuade him to take the case. Also important to the story is Matt’s relationship with then girlfriend Glorianna O’Breen. 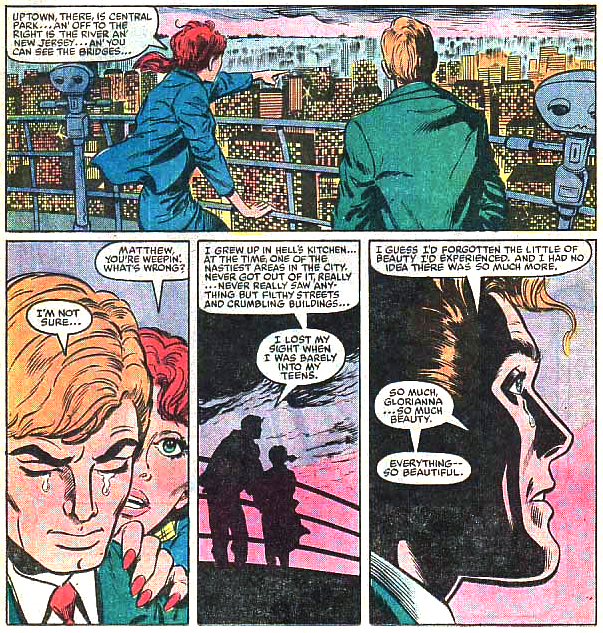 When her camera is stolen, Matt goes off as Daredevil to search for it, and it is during this particular mission that the Beyonder decides to use his powers to give his would-be lawyer the gift of sight. 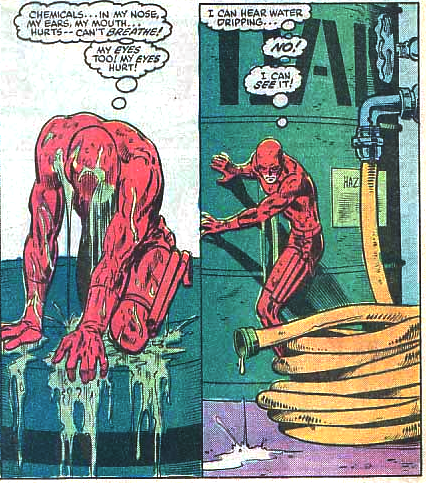 Unfortunately, this sudden change throws Daredevil off to the point of losing his balance and falling into a big tub of nasty chemicals. 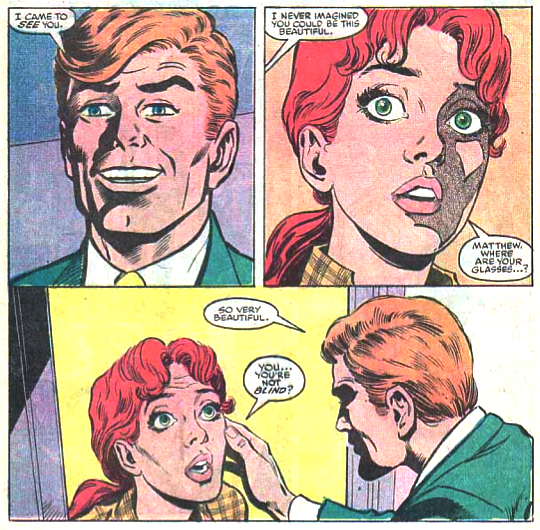 While this issue is hardly unique in having Daredevil somehow regain his sight, it is interesting in that it fully examines the effects this change has on him. In the past, when Matt could see through the eyes of Doctor Doom, or when Moondragon helped him recover his sight, he would have a brief moment of joy and surprise before getting on with the adventure at hand while realizing that his sight only served to hold him back. In The Price, Matt gets to keep his heightened senses in addition to being able to see, and enjoys it as fully as one would expect. He starts off by doing some sight-seeing in his home town. 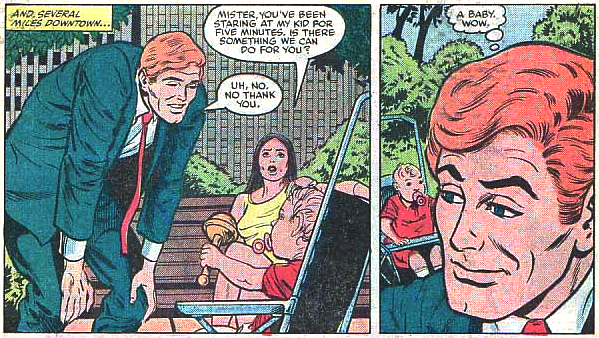 Maybe things were different twenty-five years ago, but I wonder what parent today would put up with having a stranger stare so intently at their child for a full five minutes. Matt seems to have completely forgotten his manners, but quickly thinks of someone else he’d like to rest his eyes on, and proceeds to Glorianna’s apartment. Glorianna doesn’t waste any time on trying to figure out how someone who should be permanently blind has suddenly developed 20/20 vision. Instead, she takes Matt out on the town where they enjoy a day together. Matt gets a kick out of Picasso – much to Glorianna’s amusement – and they watch the sun set over New York. 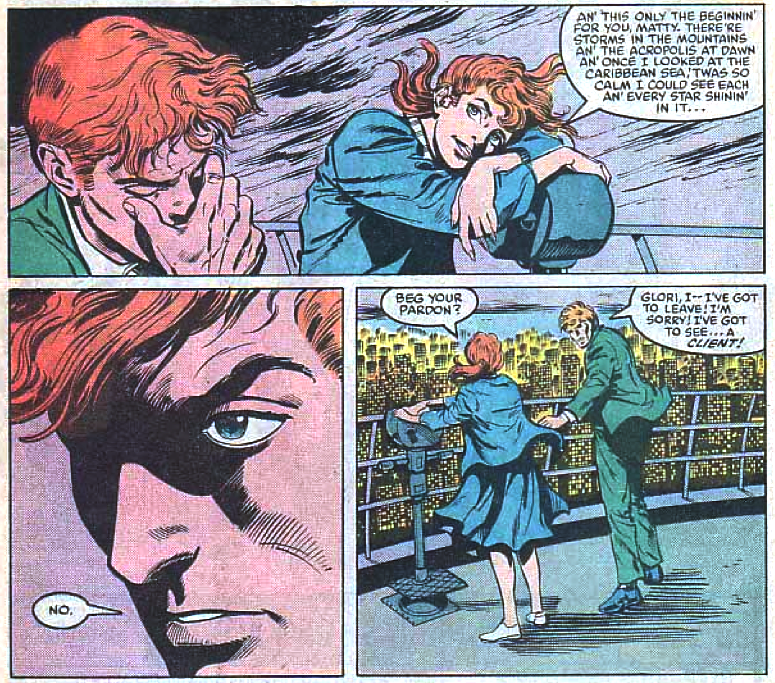 When Glorianna finally takes Matt to see the view from the Empire State Building, Matt is moved to tears, and the scene has quite an impact on the reader as well. It is very well written, and beautifully drawn by David Mazzucchelli. It is at this point that Matt makes the difficult decision to give it all up. Obviously, there is no other way for this issue to end. No writer could ever get away with restoring Daredevil’s sight permanently, and given the limitations of where the story is allowed to go, O’Neil does a good job of tapping into Matt Murdock’s psyche and using a line of argument that makes at least some sense. “I have to admit you really hit the nail on the head — this ‘retainer’ of yours is a wonderful thing. Too wonderful. It means a great deal to me. It means everything to me! I — I never realized..! And that’s the problem, Mister! The longer I have my sight back, the plainer it is that I value it too much. Maybe enough that I’d do anything to keep it. And that worries me… Because that ‘profound sense of justice’ of mine is even more important to me. There’s no place anything which compromises it — or might compromise it. No room for any doubt. 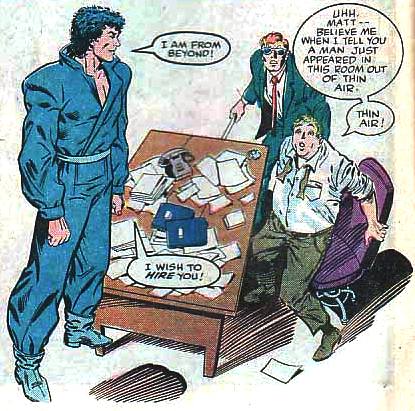 Even when the Beyonder offers Matt the chance to keep his sight even though he won’t be taking him on as a client, Matt insists that he take it away. Daredevil #223 is a great issue that shows just how noble Matt can be (when he’s not running a ninja clan) while also dealing with the reality of the considerable loss that resulted from the accident that gave him his abilities. 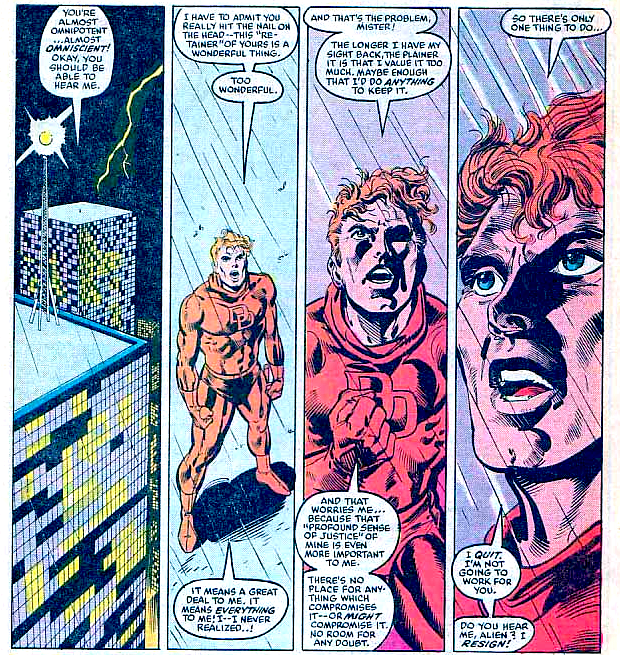 Yes, it’s got jheri curls and goofiness, but it packs a huge emotional punch as well, and this issue easily belongs on my top twenty list of the best issues of Daredevil, past or present. The Mazzuchelli drawn run of Daredevil…that culminates with the Reborn storyline…is the era of Daredevil that brought me the most joy in comics…period. The stories were so human. The art was fantastic. I haven’t read through your Daredevil blog in its entirety…but don’t forget to mention the Sixgun Kid issue if you haven’t already. I have to imagine that it’s highly underrated, but it was a great read. I just looked at my old DD back issues. I meant to write Two Gun Kid, not Sixgun Kid. Great DD issue! Just discovered this post. That issue has always been one of my favorites (and so has the Two-Gun Kid story, of course). You sum it up beautifully. You forgot my favorite line, though … “Take it back, or I’ll sue.” Classic Matt. Restore his heroic burden, or he’ll skip the wimpy ninja stuff and go lawyer on you!